Home > Blog > AC Rental > Are you ready for winter? Andrews Sykes Climate Rental Middle East offer a Solution focused on Chiller Maintenance for your Existing Building. Routine maintenance is an essential part of maximising performance & efficiency from your HVAC equipment. This includes the smallest split system air conditioner to the large multi-chiller plant. A preventive maintenance plan should be carried out each year. With reduced temperatures during the winter months there is no better time to act! Andrews Sykes Chiller Rental offers a carefully managed solution to ensure there are no variations in comfort or ambient temperatures during this major chiller overhaul. Yes, we provide you the temporary chiller during winter 2018-2019 while you carry out the preventive maintenance on your existing chiller. Andrews Sykes Climate Rental Middle East have one of the largest range of portable air conditioner and chiller rental fleet in the UAE/GCC market. Andrews Sykes can offer a complete climate control rental solution to run in parallel or independently with your existing system. Whatever your requirement, we are confident Andrews Sykes Air Conditioner Rental will provide you with the most effective solution with regards to time and expense. Our team of experts at Andrews Sykes aim to exceed customers’ expectations when responding to service calls relating to an emergency or enquiry about temporary climate control or a building under construction requiring wild air cooling. 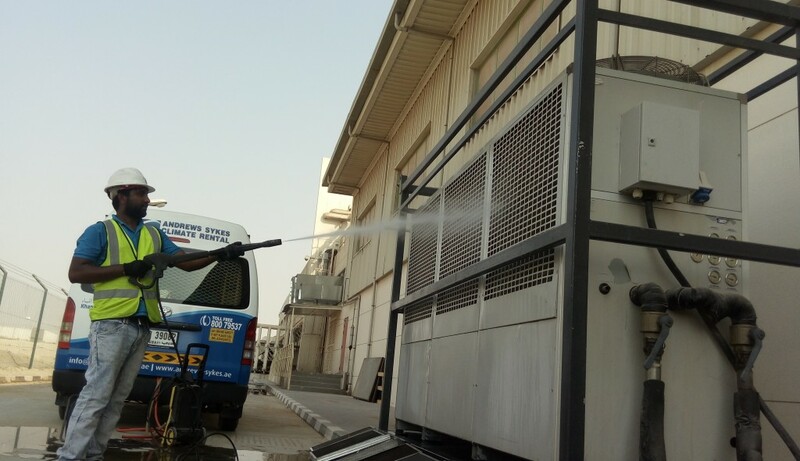 This article was posted in AC Rental, Air conditioning rental, Chiller Rental, Dehumidifiers, Emergency Cooling, Portable Air Conditioner Rental, Ventilation Rental UAE and tagged AC rental Dubai, Air conditioner Rental UAE, chiller hire dubai, chiller rental dubai, chiller rental solution, Emergency cooling, HVAC Rental, temporary climate control, Ventilation Rental. Both comments and trackbacks are closed.